An annual Battle of Britain memorial parade and service, a cenotaph and an air training school are some of the suggestions being made by developer Stone Hill Park to preserve the aviation heritage of Manston airport. SHP submitted a masterplan to Thanet council last year containing proposals to build 2,500 homes; an advanced manufacturing focused business park; sports and recreational facilities, with the former runway becoming the focal point for a network of parkland, trails and outdoor space, and a ‘heritage hub’ at the site. The plans follow the closure of the airport in May 2014 by Stagecoach tycoon Ann Gloag who bought the site for a nominal £1. SHP say suggestions under review include a green runway – with significant features; an air cadet base; aviation themed public art – including replicas and memorials; annual flying days featuring historic and replica aircraft and street names and other community resources reflecting the site’s historical past. The developers say securing a sustainable future for the Spitfire and Hurricane Museum and the RAF Manston History Museum lies at the core of the strategy and there will also be references to the site’s aviation past throughout the 800-acre development. Spokesman Ray Mallon said: “The owners have already gifted land for the two museums and they have the business background to provide advice to help get them on to a sound and sustainable financial footing. “That’s an important anchor point, but we don’t see the museums standing in isolation. The heritage of Manston is a theme that will run throughout the development. That could be through street names, public art, creative use of the grass runway, community events or in other ways. Stone Hill Park held public consultation prior to submitting which, they say, will bring jobs and a multi-million pound boost to the local economy. Mr Mallon has also met members of groups fighting to bring aviation back to the site instead of homes. He said: “ I have met with Keith Churcher, Dan Light and Ken Wraight from the Save Manston Airport group. Of course, there are issues on which we disagree but equally there are issues on which we have common ground and which we can work together on. Mr Mallon said the site could offer a full size Spitfire replica and a junior football or cricket club. But there are alternative proposals for the site. RiverOak Strategic Partners Ltd, a UK registered firm which is not a subsidiary of the American RiverOak company originally involved in the plans, is pursuing a Development Consent Order through Central Government to allow for a cargo and aviation business to be installed at Manston. 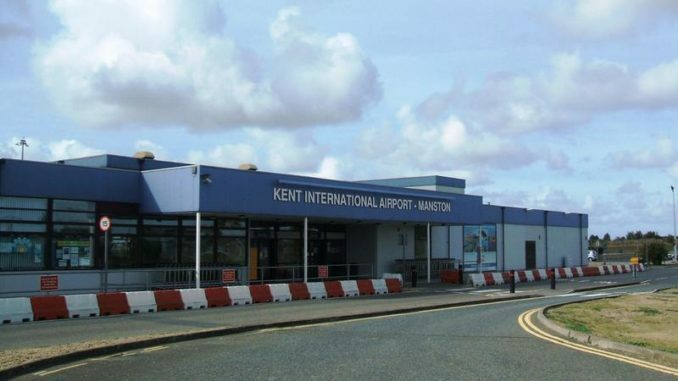 A third interested party, City investor Edi Truell, has announced a plan for his company, Disruptive Capital, to carry out a viability report into Manston’s future as an airport. Campaigners are not happy with the heritage plans announced by SHP. Save Manston Airport issued a statement saying: “We would like to clarify the misstatement from SHP and the groups position on Manston airport. The SHP (Stone Hill Park) press release may have given the impression we support their plans for a grass strip runway. This is not the case. We only support a fully operational airport using the existing concrete runway. “The heritage aspect of the airport is important to us and by us agreeing to discuss this topic with SHP does not in any way imply we recognise their plans for housing. Housing is not the future we wish for Manston and it never will be. We recognise and are encouraged that SHP has aspirations to preserve the heritage of aviation. We believe this is best served through the re-opening and expansion of an operations at the airport. It said: “The statement published by SHP seems to be a blatant attempt to hijack the history of Manston airfield and appears to be nothing more than emotional blackmail in a thinly disguised effort to win round public support. “The Supporters of Manston Airport are not about to compromise over the loss of the runway, the site’s primary asset, which will consequently forever thwart the future of Manston as an operational airport. “Our fight for Manston centres around the viability and potential of the runway going forward and SHP seem to expect that the campaign will be satisfied with a grass airstrip which may occasionally facilitate the odd light aircraft, if we are lucky! The group say a revived airport would create jobs and encourage specialist skills. A spokesman for Save Manston Airport association (SMAa) said: “Save Manston Airport association have just this week paid for and distributed 10,000 leaflets asking the people of Thanet to give their opinion regarding the Thanet Draft Local Plan Consultation, particularly with regard to the airport. “SMAa have to be a little careful as to what we say, as we hope to be giving evidence this week at the much delayed National Planning Inspector’s Enquiry into the Stone Hill Park’s appeal regarding having a change of use application on four hangars / airside buildings, on Manston airport. A spokesman for the No Night Flights group said they were backing the regeneration plans. They added: ” As a group No Night Flights are delighted that the heritage side of the airport is getting the attention it deserved by the owners of the site. But Mr Mallon says there is no aviation future for Manston. The reports include the one by aviation consultants Avia Solutions, commissioned by the council last year. The findings, and the methods used, have been disputed by campaign groups and Manston supporter North Thanet MP Sir Roger Gale. A “Heritage and Aviation Offer” will be released by SHP later this year.